Get the card that can help you get things done. The PayPal Business Debit Mastercard® lets you use your PayPal balance anytime-in store and online-with no annual fee. Already have the card? Activate now. Make business purchases everywhere Mastercard is accepted, in person and online. Less waiting. More getting stuff done. 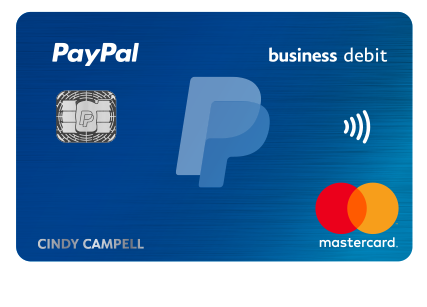 With the PayPal Business Debit Mastercard, there’s no need to transfer money from your PayPal balance to a bank. Just immediate access to the money you need to restock, pay vendors, and purchase the hottest new item-before the competition. Don’t just earn money. Get paid. The cash back benefit can give your business extra cash. Unlimited 1% cash back that’s added to your PayPal balance each month, based on eligible purchases. That’s more money to buy more inventory. Build more products. Whatever your business needs. The PayPal Business Debit Mastercard lets you use your PayPal balance everywhere Mastercard is accepted. Below are just a few ways PayPal can help your business thrive. Sell online with a customizable e-commerce platform and secure payment processing. Get extra funding for your business in minutes, with one fixed fee and no periodic interest. Magnetic swipe, chip card, contactless-accept more forms of payment wherever your business goes. Set up your own personalized business link and get paid. Does my PayPal account need a minimum balance? No. You can use the card to spend your PayPal balance everywhere Mastercard is accepted. Eligible purchases include, but are not limited to, purchases processed as a credit transaction. PIN-based transactions do not qualify. Please see Cardholder Agreement for complete cash back details. Are there any fees for using the debit card? Is there a withdrawal or spending limit for the debit card? Standard daily limits include $3,000.00 USD for purchases and $400.00 USD for cash withdrawals. Refer to Cardholder Agreement for complete details. Can I request an additional card for use on my account? Yes. Simply call the toll-free number on the back of your card. There's no charge to receive an additional card. You will be liable for all transactions made on your account by any authorized users, as if they were your own transactions. Does the card protect me from fraudulent charges? PayPal Business Debit Mastercard Cardholders automatically receive zero liability for any unauthorized charges. * For details view the Mastercard Guide to Benefits. *Conditions and exceptions apply, see Cardholder Agreement. Log in to your Business Account, and we’ll point you in the right direction. How do I enroll in cash back? Need additional help with an existing PayPal Business Account? Log in to your PayPal Business Account to request your card-there’s no annual fee. Use it everywhere Mastercard is accepted. 2ATMs must display the Mastercard®, Maestro® or Cirrus® Acceptance Mark. Up to $400 USD daily withdrawal limit applies.